A list of Pagan Websites and resources. White Witch, the Pagan and Magick Emporium for all your magickal needs - from the beginner to the adept. Housed in a beautiful, atmospheric 500 year old building, staffed by friendly witches and magickal practitioners, we provide items to suit all magickal paths - including many wondrous hand-made products by Pagan artisans. White Witch is a family business, trading since 1999, and we are extremely proud to be the first Pagan retailer to have won 'The Best Independent Retailer Award', and warmly welcome both physical and virtual customers. So come on in, new friends are always welcome! A blog dedicated to the goddess in her many forms. Your members may be interested in following sub-titled, bi-lingual film. It can be embedded on any website. Spiorad na Samhna -- Spirit of Samhain https://vimeo.com/101398600 http://www.derryjournal.com/what-s-on/arts-culture/international-praise-for-derry-halloween-film-1-6725432 Film traces origins of Ireland's biggest Halloween Carnival in Derry back to troubled years of 1980s. It also traces origins of Halloween itself to the Celtic festival of Samhain. Dr. Jenny Butler from the Folklore Department of University College, Cork narrates this. Film uses footage from spectacular 2013 Inferno show, produced by LUXe, based in Donegal. Dessie Baker, Director. Domina Lunae is a Dianic Spiritual Organization operating within Italy and UK which aims to help and support women interested in Dianic Tradition and women's spirituality. Dianic tradition is a Goddess and female-centered, earth-based, religion. It is a creative tradition based on the five blood women's mysteries and its practices include celebrating and honoring the physical, emotional and other life cycle of women. Also Dianic tradition recognizes the greater or lesser effects and influences of the dominant culture on every aspect of women's lives providing a spiritual healing path that can help women to regain their self-sovereignty. Dianic rituals celebrate the mythic cycle of the Goddess in the earth's seasonal cycles of birth, death and regeneration, as it corresponds to women's own life cycle transitions. Inspired by the nature and aspects of the Roman goddess Diana as a protector of women and wild nature, Dianic Witches are committed to finding positive life-affirming solutions for personal and global problems. Dianics envision and strive to create a world where the web of life, which includes all living things, is honored and respected as a sacred creation of the Goddess. Merry meet! My name is Lilly Dupres and welcome to Define Pagan where I hope to provide the definitive Pagan Definition for the modern lifestyle. Blessings. A very old site recently converted to .pdf files with articles about essential oils-non commercial. Run by a qualified independent herbalist. Information on the ongoing threats to the existance of herbal medicine. Information on the determination of the medicines control agency to eliminate herbal medicine by continually banning herbs that therapists may use. As far back as 560 B.C. priests and scholars were penning texts condemning witches. Click to find out more about this dark history. Candles, oils, incense sticks and cones, all the items you must own. Wands and jewellery, books and clothes, spells and hexes, gifts and stones. Tarot cards, fairies, magnets too, and witches mugs for your witches brew, moon phases, photos, events and more, mix it all up to see whats in store. The witches shop is the place to be, for all the things for your witchy needs. Abraxas Literary Editor, Christina Oakley Harrington introduces the new issue of Abraxas Journal and talks about why we do what we do in Amsterdam as part of the Enchanted Modernities Conference. Capall Bann is a Pagan owned and run publishing house. Formed in 1993 by Julia and Jon Day to publish books with real information for Pagans, not coffee table books. We now have over 300 titles in our range. Delve into the world of mythology. Read lost folktales, here about paranormal sightings and learn about the myths that have inspired fantasy worlds. From Vampires, Ghosts, Dragons, Elves, Fairies, Demons, paranormal beings and fantasy like creatures you will find them all here. The web’s oldest Cornish Witchcraft site, and web-home to Ros an Bucca; a founding recension of the contemporary ‘Pellar Current’ and modern Traditional Cornish Witchcraft. This Pagan calendar shows Pagan, Witch, Druid and Heathen festivals, dates and events. Important neo-pagan festivals and religious holidays are included even if research into the origins are sketchy, as they are important in modern paganism. 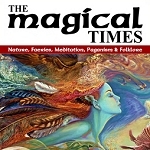 The Magical Times Magazine is the professionally printed full colour publication based in the UK. Each issue is packed with articles, art features and stories ranging on a wide selection of faerie, magical and spiritual subjects. Each page is uniquely illustrated in full colour and is printed on high quality silk paper. Magazines are available to order anywhere in the world - we ship internationally!